How can one programme be applied so successfully across such a wide range of industries? We know what best-practice looks like across many different sectors. We have experience introducing change into companies with contrasting organisational cultures. We take an integrated approach that empowers people and makes the most of their skills and abilities. We provide training and support to practitioners to develop their competency in applying our new innovative methods. We work with Kellogg’s, PepsiCo, Montupet, Viridor, Welsh Water and many other companies. Please take a look at our case studies below and read the benefits our clients have gained through working with us. We are working with Welsh Water as their chosen consultants to extend their lean maintenance programme into Lean Operations. Our IMPACT Programme™ has been implemented across Welsh Water sites to improve efficiency and reliability. 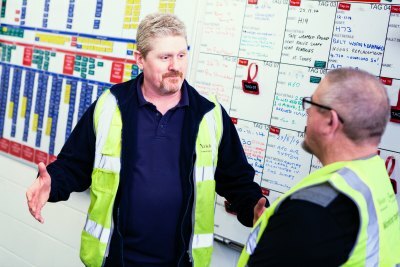 As part of our change readiness programme, we involve not only repair and maintenance team members but the whole cycle production including operators, maintenance and managers.